RWA was tasked with transforming a raw retail storefront into a bar and lounge space. The Connect, located in the bustling Jamaica Center Business Improvement District, is meant to be a place of community and connection for both the locals and the many commuters who pass through the bustling commercial district. 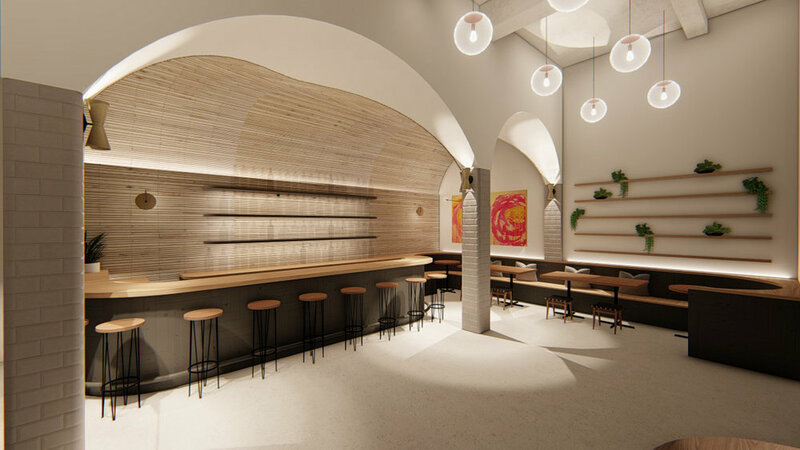 The proportions of the raw storefront space with ceiling heights reaching 20 f. presented a design challenge as they were not conducive to creating the intended intimate connections. To that end, RWA used a lowered barrel vault ceiling over the bar to visually anchor the space and create a human-scale experience in contrast to the soaring ceilings elsewhere. The seating arrangements transition from the casual and inviting lounge seating at the entry to the fixed and more formal booth seating at the back of the space. This allows for a variety of experiences and discovery within the space. Finishes were left natural and raw throughout with concrete flooring and natural wood and blackened steel at the bar.